There are around 180 different types of chameleons and they vary in size, color, and appearance. Even though there are many types of chameleons only a few are readily available as pets. Not all will make ideal companions. Some require more specialized habitats and others do not have the best disposition. Before you decide on what type you want, research what it requires to keep your pet healthy. Below are general descriptions of some of the more common chameleons kept as pets. The carpet chameleon is found in Madagascar. They are a smaller species and males grow to around 9 inches long. They have a short lifespan and only live for 2 to 3 years. Daytime temperatures should be around 75* F with 65% humidity. 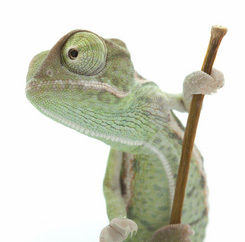 They are active and hardy chameleons that do well as pets. The Fischer’s chameleon can be found in Kenya and Tanzania. These moderately sized lizards can grow to be 15 inches long and live up to 3 years. A daytime temperature about 75* F and a relative humidity around 75 to 85%. With experienced care these chameleons can do well. Flap-necked chameleons can be found in eastern and southern Africa. They can grow to around 13 inches long and live around 2 to 3 years. They require a daytime temperature around 75* F and a humidity around 75% humidity. They are hardy lizards, do well in captivity, and can make nice pets. The four-horned chameleon can be found naturally in Cameroon. They live for around 5 years and can grow to be 14 inches long. They require daytime temperatures around 75* F and a relative humidity of at least 85%. They are attractive chameleons that tend to do well in captivity if you can provide a suitable habitat with very high humidity. In the wild, Jackson’s chameleons can be found in East Africa. They were also introduced to Hawaii where wild specimens can now be found. They can grow to be around 13 inches long and can live up to 8 years. A daytime temperature of 75 to 80* F and a humidity level around 65% is required. These three horned chameleons are readily available as pets. The Meller’s chameleon can be found naturally in East Africa. They can be over 24 inches in length and can live up to 12 years. They require a daytime temperature around 80* F and a 70% humidity level. They are aggressive and are not a good choice if it is your first chameleon. The Oustalet’s chameleons can be found naturally in Madagascar. They are large reptiles that can grow up to 30 inches long and can live up to 12 years. Provide a daytime temperature around 80* F and a relative humidity of 70%. These lizards can be good pets if you want a larger chameleon. Panther chameleons are from the northern part of Madagascar. Males are larger than females and can grow up to about 20 inches long. They live for about 5 to 7 years. The panther needs daytime temperatures around 80* F and 70% humidity. They are attractive, tend to do well around people, and are a good choice for a pet. In the wild, veiled chameleons are found in Yemen and Saudi Arabia. Males can grow to be 24 inches long and they can live up to 5 years. They need daytime cage temperatures around 80* F and a relative humidity of 70%. Veiled chameleons will eat some plant matter in addition to insects. They are popular pets and can make a good first chameleon.